Archer fish shoot water jets with enough force to knock prey into the water from overhanging vegetation. 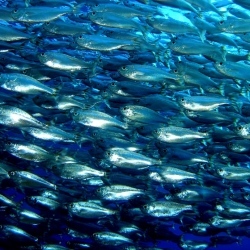 Research by a team from the University of Milan shows that the fish’s forceful strike is formed externally using water dynamics, rather than using the body’s internal muscles. This technique allows the animals to take accurate shots from up to 2m away. For years scientists studied archer fish (Toxotes jaculatrix), searching for evidence of specialised internal organs that are adapted to this water-pistol-like hunting technique. But previous studies have ruled out this idea. The new research, published in the PLoS ONE journal, demonstrated that archer fish "modulate" the velocity of the water jet as they spit to alter its shape through the air. The head of the water jet increases in volume from liquid arriving from its tail to form a large drop, which hits insect prey with greater force.